SPI OFFERS ULTRA LONG RANGE FLIR THERMAL IMAGING PAN TILT PTZ GIMBAL SYSTEMS FOR BORDER PATROL SCOPE TRUCKS. BORDER PATROL AND PROTECTION SCOPE TRUCKS REQUIRE STABILIZED HIGH QUALITY LONG RANGE DAY/NIGHT CAMERAS FOR DETECTION IN EXCESS OF 10 MILES, SPI’s LONG RANGE IMAGING SYSTEMS ARE IDEAL FOR SCOPE TRUCK APPLICATIONS WITH ULTRA EXTREME LONG RANGE DETECTION CAPABILITIES WHILE KEEPING THE IMAGERY ROCK STEADY AND STABLE WHILE VIEWING IN ZOOM TELEPHOTO MODES. SYSTEMS LIKE THE HIGHLY CUSTOMIZABLE M7 / M9 SKIDS ARE MFG FOR THE EVER DEMANDING SCOPE TRUCK OPERATOR. Terrorists don’t care if it’s night, day, rainy or snowy when they attack. That’s why SPI Corp believes that neither should thermal imaging cameras when it comes to security and surveillance. With threats coming in from all angles, via land, sea and air, homeland security relies on our PTZ/handheld thermal imaging cameras with full pan tilt zoom capability to get the job done in any conditions with no restrictions. Whether mounted on trucks, buildings or UAS & UAV drones, our infrared imaging systems remain a reliable means of detecting human and various other threats from a safe distance away. Our long range thermal imaging surveillance / Security night vision cameras work in total darkness and low light conditions, and out perform most night vision systems because they do not require any light to operate as many models of night vision systems do. Our infrared EOIR security cameras can also be integrated into existing border security systems to provide the ultimate in surveillance, 24/7/365. SPI long range thermal imaging security systems come with a wide array of options including handheld, mountable, wireless & pan tilt zoom models, some of which also feature full color CCTV cameras for ultimate day time optics coupled with thermal vision. So whether you are a law enforcement officer looking to gain footage for evidentiary purposes, a border patrol agent on the tail of drug traffickers or just need to implement thermal imaging solutions into your existing security regimen, we have many affordable options to offer. There truly is no where to hide from SPI long range FLIR PTZ thermal imaging camera systems. Let us develop the best custom thermal imaging solution for you. Contact us today to learn more about our thermal imaging surveillance cameras. Call (702) 499-9551 in Las Vegas, toll free at (800) 403-2983, or email us at sales@x20.org. The new SPI HD multi sensor pan tilt unit M11 is a state-of-the-art high grade multi sensor pan tilt zoom unit that is built with the highest performing products and sensors available. The rugged pan tilt unit is a weapon grade pan tilt gyro stabilized gimbal turret, the multi sensors include long range cooled InSb Mwir FPA thermal imaging Flir detector with extreme long range CZ continuous zoom auto focus lens from 25mm – 1550mm, the daytime visible HD camera is comprised of the lowest light gathering ultra sensitive CMOS sensors with zoom lenses exceeding 3000mm. The unit has add in lrf laser range finders, ir infrared lasers, GPS, compass, and SWIR, NIR and LWIR options. The MX5 marine / Border patrol, Scope truck UGV PTZ Dual FLIR Thermal Sensor High-performance camera with both thermal/optical video output Image control and quality are integral aspects of any PTZ camera, and the MX5 Border / UGV thermal flir PTZ delivers. A high-quality day/night camera EO core with 500X total Zoom, and a high-performance, uncooled thermal imaging core sit side-by-side within the housing. The MX5 Marine/ Border / UGV Thermal FLIR PTZ has two video outputs – one for the optical camera and one for the visual CCTV Camera, lasers are available as an option. M9 Ultra Extreme Long Range PTZ FLIR thermal security camera for Border patrol, protection & Security. The M1D Family of pan tilt zoom thermal security cameras give you the ultimate in 360 degree 24/7 situational awareness. 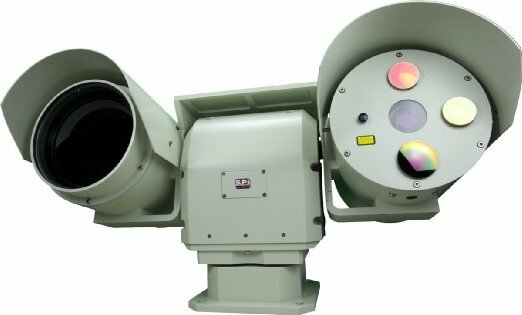 Fully equipped with thermal sensors, a laser pointer and CCTV camera, the M1D is a completely weatherized thermal imaging system that mounts just about anywhere, magnetically on vehicles or affixed to marine vessels & UAV drones via hard mounts. The M1D thermal cameras feature ultra-rugged housing and image stabilization with a compact size offering performance & convenience in one small, lightweight package. These fierce little infrared cameras come in several configurations, including wireless models to offer supreme surveillance capability from a safe distance away in combat zones, border patrol missions or homeland security operations. The M5 Family of pan tilt zoom thermal security cameras are available in a variety of configurations to give you the best long range thermal surveillance possible. These multi-sensor PTZ cameras are the hardest working, most rugged security cameras made today, making them the perfect thermal imaging solution for law enforcement and patrol or combat operations. The M5 housing is made to take a beating in any weather or situation, featuring an integrated wiper system for the clearest thermal vision possible. These long range thermal security cameras are suitable for fixed mounting on vehicles, buildings or marine vessels and can be integrated into your existing infrastructure. The M7 PTZ thermal imaging cameras are serious extra long range systems for the most critical applications. These easily mountable, highly mobile infrared camera systems can put up with anything you throw their way, and are perfect for military, law enforcement & border/homeland security operations. The M7 Thermal FLIR Infrared Imaging Camera payloads are fully ruggedized and sealed military grade PTZ Pan Tilt Zoom platforms. The M7 comes in MWIR (Mid Wave Infrared) and LWIR (Long Wave Infrared) and packs telephoto zoom long range optical lenses with Continuous Optical Zoom all the way to achieve Effective 3000MM focal Length and with Human Detection Ranges that Exceed 20 Kilometers. LRF Laser Range Finders and a host of Multi Sensors are available for inclusion on to the M7 Camera, Contact SPI with your unique Custom applications. Long range LWIR and MWIR can be VERY Expensive, SPI will offer you the most affordable solution packing the highest quality sensors, lasers and optics with the highest performance possible! The m7 PTZ Flir thermal camera is the worlds highest performing affordable pt pan tilt thermal camera. The unit features continuous wide to telephoto optical thermal zoom germanium lens that maintains its focus throughout the entire zoom cycle and has the capabilities of 20 kilometer (km) detection distance ranges. The included 500x tv reconnaissance camera offers crisp color/low light CCTV imaging with a high fidelity CMOS sensor EO camera. The unit is a great day/night imaging platform catered for driving, navigation aid, long range vehicle, mast mounted and marine applications. We have many more pan tilt zoom thermal security systems available to fit any mission profile. We also have long range handheld thermal imaging systems & thermal imaging cameras for law enforcement. Click here to view our entire catalog. Protecting a country’s borders is vital to its national security. No matter what hour of the day, the job is an enormous undertaking that becomes even more challenging under the cover of darkness. Long Range PTZ (Pan Tilt Zoom) FLIR Infrared (IR) thermal imaging cameras provide another set of eyes for border control professionals and help them meet the demands they face at night and in other low-light situations. IR cameras detect the invisible infrared energy that all people and objects emit, and can “see” better than the naked eye at night and in bad weather. Whether searching for a fugitive or performing a special surveillance operation or routine patrol, darkness can be the greatest obstacle to border control professionals.Long Range PTZ FLIR Infrared thermal imaging cameras equip border control personnel with a whole new way of looking at the world. In simplest terms, thermal imagers operate like the human eye, but they are much more powerful. Energy from the environment comes through a lens and is registered on a detector. In the case of the infrared thermal imager, that energy is heat rather than light. By measuring very small relative temperature differences, invisible heat patterns are converted by the thermal imager into clear, visible images that the human eye can see through a viewfinder or TV monitor.All objects that are not at absolute zero temperature (0 degrees K or -459.67 degrees F) emit various types of electromagnetic radiation including infrared. The hotter an object gets, the more infrared radiation is emitted as a result of the thermal agitation of its molecules and atoms. The spectral distribution or wavelength of this energy depends on the nature of object (i.e. its relative effectiveness as a radiator, called emissivity) and upon its temperature. Blacker colors and duller surfaces usually have a higher emissivity and radiate infrared energy more effectively. Lighter colors and shinier surfaces radiate less effectively. Because the energy being sensed is heat and not light, Long Range thermal imagers can be used in both daytime and nighttime operations to find people, avoid obstacles or detect fire hot spots. Due to their own levels of infrared heat energy, people are easily seen 24 hours a day. Thermal imagers are usually very sensitive and can detect temperature variations as small as 0.1 degrees centigrade, even in less than ideal environmental conditions. Since they are unaffected by the amount of light in a scene, they won’t “bloom” or shut down in direct light. Border patrol security, surveillance & Defense Thermal imaging pan tilt and fixed cameras are widely used for Homeland Security. Thanks to their ability to detect human-sized targets several kilometers away, they are extremely suited for border as they create an invisible fence. SPI Family of long range border security thermal imaging cameras can detect human-sized targets at a distances exceeding 25 kilometers. Not only land borders need to be protected. Thermal imaging cameras are the perfect tools for coastal surveillance as well. Small vessels can be detected at extremely long ranges. SPI has a broad experience with Homeland Security projects and markets a wide variety of thermal imaging cameras for this application. Multi-Sensor Systems are also available. We work with you our customer to design the perfect thermal imaging solution but the camera is a part of the package, the entire network is established for local or remote observation and controlling of the systems. SPI Works with end users, integrators and consultants to meet mission requirements. The Reliability of the gimbal endlong with the entire system have to be able to withstand extreme weather and harsh environments, our ptz gimbal platforms are the absolute most ruggedized and reliable systems available today with 100% duty cycle, weapons grade shock resistant stabilizers and nitrogen purging.